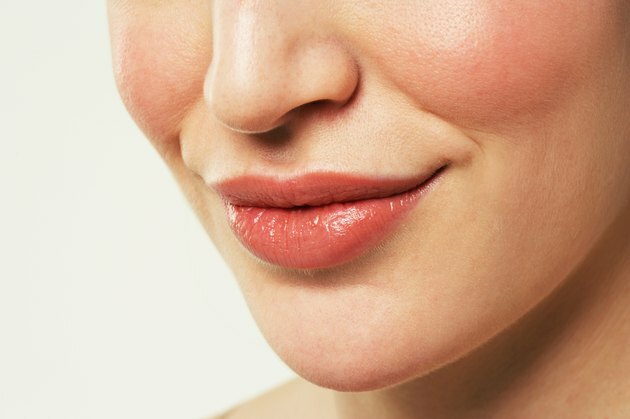 Small white bumps can appear on the lips because of many different causes. While some types of lip bumps may be benign, others can be symptoms associated with certain medical conditions. Sexually transmitted diseases, cancer and allergic reactions are some medical conditions that can present symptoms of white bumps on the lips. Because lip bumps can be symptoms of different ailments, it is important to seek a medical diagnosis for proper treatment options. Fordyce granules are small, whitish or yellow papules that can develop on the genital areas, but also tend to appear commonly on the border of the lips. These granules, which can form as small group cluster, are sebaceous glands that contain no hair follicles. Believed to be present at birth, these bumps begin to grow and become more visible after puberty. Found in approximately 80 to 95 percent of the adult population, fordyce spots are benign, non-contagious and do not require treatment. Caused by the herpes virus, herpes labialis is an oral infection that causes cold sores or lip blisters to develop on the lip and mouth areas. The virus is contagious and can be transmitted through personal contact, such as kissing, sharing utensils or using infected items. Accompanying symptoms of herpes labialis can be painful lip papules, fluid-filled blisters, fever and swollen neck glands. Although the condition can clear on its own within two weeks, antiviral medication can help with the symptoms. Recurrence of the virus is possible, and complications can occur in people who have certain medical conditions, such as cancer. Oral cancer can present many symptoms, including bumps in the mouth, throat or lip areas. Some specific symptoms of lip cancer are open lip sores that may not heal and lip lumps that are hard. Risk factors for oral cancer can include excessive use of alcohol or tobacco and precancerous conditions such as leukoplakia. If undetected and left untreated, oral cancer can be fatal. Having regular dental checkups may help in the early detection and treatment of any suspicious lip bumps. Contact dermatitis also can cause lip bumps. Small lip blisters or papules can form when people experience an allergic reaction to certain foods or toothpastes. Skin reactions to oils found in fruits such as mangoes can produce a rash or papules on the lips. Benign tumors called fibromas can also develop on the mouth or lips. Because there can be so many causes for lip bumps, you should see a doctor for a diagnosis and treatment.